Provides a guide to the techniques used in dermatological surgery. This book describes the principles, limitations, and indications of basic techniques used in dermatological surgery. Fully illustrated throughout with colour prints and line figures, this book is useful to clinicians undertaking minor skin surgery. Dermatologists, general practitioners and dermatological surgery nurses are frequently involved in performing simple surgical procedures on the skin. With minimal equipment and patient discomfort, a wide range of skin lesions can be managed effectively and with good cosmetic results. This book provides a concise, and comprehensive guide to the techniques used in dermatological surgery, with the aim of developing skill and proficiency in this field. 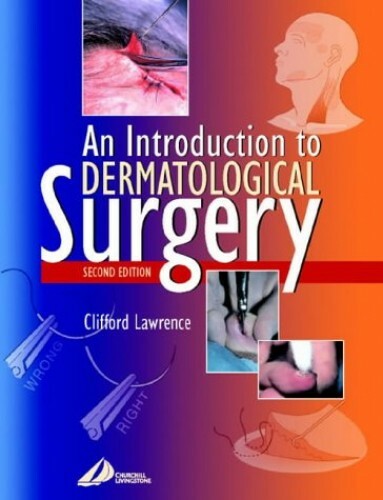 The book describes the principles, limitations and indications of basic techniques used in dermatological surgery. The introduction covers preoperative considerations, such as equipment, anaesthesia, patient assessment and haemostasis. The various different types of surgical procedure are then described with the aid of step-by-step colour photographs and line drawings. Postoperative complications, skin tumour management, the role of the dermatology nurse and the medicolegal aspects of skin surgery as performed by specialists and non specialists are also dealt with. Fully illustrated throughout with colour prints and line figures, this book will make a highly practical and useful reference to all clinicians undertaking minor skin surgery.